Diane Davy, is the Executive Director of Work In Culture and the President of Castledale, a consulting company specializing in the business of the cultural sector. With over 25 years experience, she brings senior level expertise and well-honed judgement to her clients needs. Her areas of expertise include strategic business planning, corporate structure and management, marketing strategies, revenue generation (including fund raising and sponsorships), board governance, project management and other related topics. She frequently works with government departments providing research and recommendations on policy and programming that impact the sector. Davy also teaches a course on the business of book publishing as part of the Humber College Creative Book Publishing Program and is part of the travelling consultants programs runs by both Magazines Canada and the Association of Canadian Publishers. Claire Hopkinson is the Director and CEO of Toronto Arts Council (TAC), a responsive, arms length funder for the City of Toronto supporting some 450 arts organizations and 200 artists annually, and of its sister organization, Toronto Arts Foundation, serving Toronto’s artists and communities through strategic, catalytic investment in the arts through private-public partnerships. Her vision for increased arts access and participation throughout the City of Toronto crystallized into the Creative City, Block by Block vision of Toronto Arts Foundation, giving rise to the Neighbourhood Arts Network, North York Arts, and research initiatives into the impact of the arts. Prior to coming to TAC in 2005, Ms. Hopkinson spent 25 years developing and producing new works of theatre, music theatre and opera, including 14 years with Tapestry New Opera, and has worked closely with many of Canada's finest creative artists including Atom Egoyan, Ann-Marie MacDonald and R. Murray Schafer. She has assumed important leadership roles in both Canada and in the USA as Vice-President of Opera America, Founding Chair of Opera.ca, Founding President of Creative Trust and Co-Chair of Groundbreaking, the 2011 ISPA Congress in Toronto. Active as a public speaker and a passionate advocate on the role of the arts, Ms. Hopkinson currently serves on advisory committees for the President of OCAD University, the Dean of Fine Arts at York University and the Toronto Steering Committee for the Commemoration of the War of 1812. She has embraced and learned much from the challenges and opportunities that these local, national and international collaborations and advisory bodies have presented. Alok is an Event Supervisor, Programming for Special Events with the City of Toronto, working on such events as Nuit Blanche, Calvacade of Lights and Doors Open. Prior to working on these major city-wide events, Alok was responsible for the commemoration of 1812 events at Fort York, and was seminal in making Fort York a key event destination in the city. He was also a Senior Producer at Harbourfront Centre where he curated the music program for over seven years. Alok's key interests include politics, digital media, music and fine scotch. There was a time when he was better known as DJ Kola. Tina Chu, Engagement Officer, possesses a broad professional history of working with diverse peoples in various settings. Throughout these experiences, Chu maintained her involvement with the arts, volunteering her time to McMaster University’s Arts Matter, The Print Studio, Hamilton Youth Arts Network and Gallery 1313, among others. In her role at the AGM, Chu is energized by distinct partnerships that integrate visual arts experiences with daily life and she is passionate about cultivating visual literacy that expands the public’s critical engagement with contemporary art. Catherine has been working through art and drama with families, children and teacher for eighteen years in Toronto. She has taught at places such as the Bloorview MacMillan Center, Spiral Garden, Bloor JCC, Toronto Parks and Recreation, Clay and Paper Threater, Jumblies Theatre, Cottingham Public School, Art works Art School, Learning Through the Arts (Royal Conservatory) City of Toronto Culture DIvision and the Art Gallery of Ontario, Catherine studied theater and voice at the American Academy in New York as well as various private workshops in Toronto including Second City Improv training. On the visual side she has studied at the Ontario College of Art and has a BFA in Criticism and Curatorial Practices. Catherine has a MES (Masters in Environmental Studies in Community Arts) from York University as well as a certificate in Environmental Education. She was the artist in residence at University Settlement, curating a large project for the 100th Greenest City and for the Toronto Neighbourhood Centres (TNC). Catherine presently works at the Art Gallery of Ontario as a studio instructor and with Montgomery's Inn as a Program Officer. John Dalrymple is currently Director, Strategic Initiatives at Canada’s National Ballet School. Previously, John held two senior positions in the School’s Development Office as well as an appointment as Professor at Centennial College in the School of Hospitality, Tourism and Culture. 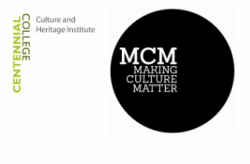 From 2001 – 2010 John was on the management team of the Textile Museum of Canada, holding the positions of Project Manager, Web Designer, Development Manager, Director of Development and Acting Executive Director. John is on the Executive Committee of the Ontario Museum Association and has sat on the Board since 2008. John is on the Board of the CreatiVenture Collective and was part of the founding committee that created this grassroots organization that focuses on partnering small and mid-sized dance organizations with active and emerging arts patrons in Toronto. He earned a Specialized Honours B.A. in Anthropology from York University and a Master of Museum Studies degree from the University of Toronto. John has conducted anthropological and archaeological fieldwork in Belize, Peru and Canada and has published works on museology in a number of academic and arts based publications. John’s work has been recognized through awards from the Canadian Museums Association, American Alliance of Museums and the Ontario Association of Art Galleries. Roxane Shaughnessy is Curator, Collections and Access at the Textile Museum of Canada, where she has lead responsibility for the development and management of the Museum’s permanent collection of over 13,000 textiles. Over the past several years she has managed the digitization and the publication of the entire textile collection on-line for global access in both English and French. Since 2002 she has worked on the development of five museum websites which engage the public in exploring textiles from multiple perspectives. The most recent, Social Fabric, is a social media web site where visitors share knowledge, stories and questions related to textiles. Roxane Shaugnessy curates exhibitions at the museum, including this past year Ancestry and Artistry: Maya Textiles from Guatemala which will tour across Canada next fall. She combines research interests in the Central and South American collections at the Museum with an interest in using the web to provide broad and meaningful access to museum collections. Anne Frost began her arts management career in the 1980s at Keyano Theatre, Fort McMurray, Alberta. Moving to Toronto, she worked at the Toronto Theatre Alliance on the Dora Mavor Moore Awards, and at Jeunesses musicales as Ontario Executive Director. and Mixed Company Theatre. She also taught in the Humber College post-graduate Arts Administration – Cultural Management program, starting in 2000. Tina Rasmussen is an arts producer and a driving force for innovation in the country’s cultural sector. She is currently the Director of Performing Arts at Harbourfront Centre, the largest multi-disciplinary art facility in Canada, where her responsibilities include curation, project- and team-management, and strategic planning. She is the Artistic Director of World Stage – Canada’s only year-round international dance and theatre series – while she also oversees numerous festivals and special projects which range from children’s programming to classical music presentation to public animations and artist development workshops including participating in the general functioning of all aspects of the art centre. As a producer, director and presenter, Tina prioritizes the development of artists and their work and creates community and financial growth by fostering innovative cultural leadership. Since assuming the directorship of Performing Arts, her approach has transformed and revitalized the World Stage brand and expanded her department’s role within the arts centre toward the community. Tina’s commitment to artistic development has given her a powerful sense of the performance ecologies of Toronto, Canada and the world. It’s allowed her to develop a network of connections to international artists and presenters that is virtually unmatched in Canada. She is a frequent guest of international governments, associations, cultural agencies and festivals, including: The Australian Performing Arts Market, The New Zealand International Festival, Tokyo Performing Arts Market, PuSh Festival, Iceland International Festival and Buenos Aires International Festival among many others. Tina has established innovative institutional exchange programmes with international collaborators such as the Traverse Theatre in Scotland and London’s Battersea Arts Centre. She worked on the programming team for Made in Scotland for the Edinburgh Festival Fringe two years in a row. Tina was recently the curator of an artist’s showcase at the Canadian Arts Presenters Association (the first time this format was adopted) and she served on the awards Jury for the Edinburgh Fringe’s Total Theatre Awards as the first Canadian ever to do so. Guided by her firm belief that art is a vehicle for positive social change and that artists are the leaders and shapers of cultural perspective, she has been a consistent and powerful advocate for culture across a range of platforms. Alex is a creator of immersive, site-specific theatre. He has developed no fewer than seven plays for site-specific venues and is currently in the process of completing a three-play cycle about the history of Toronto, the most recent being Firebrand. Alex is also a prolific actor, producer and director. He works closely with Theatre by the Bay year round as their Artistic Producer. He lives in Corktown and works for the University of Toronto and the Art Gallery of Ontario. In his so-called "spare time", he likes swimming and going for long, arduous hikes. Jonathan is a founding member and current Associate Artistic Director for Single Thread Theatre Company. He works primarily as a Director and Fight Director and has directed six Single Thread productions, including such flag-ship shows as Much Ado About Nothing at the Spadina Historic House and Gardens and Julius Caesar, Single Thread's first foray into immersive, site-specific theatre. Jonathan is an honours graduate of Queen's University with a degree in Drama and Classical Studies where he was awarded the Edythe Zacks Millman Prize. He currently lives and works in Toronto. 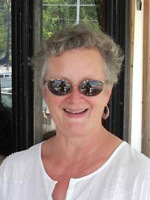 Cathy Molloy has been the Director of Markham Museum since August 2008. Armed with graduate work in Near Eastern archaeology, Cathy started her work career at the head office of Peoples Jewellers and was quickly promoted to a sales auditor while taking several business courses at night school. After a few years at home with young children she was lured into the museum world as a part time interpreter and later full time Curator at the Oshawa Community Museum. In 1998, she accepted the position of Curator at Markham Museum, eventually being promoted to the position of Coordinator of Visitor Services. In 2005, Cathy accepted the position of Executive Assistant to two Markham Councillors, an experience that proved to be an incredible learning opportunity. The Aurora Historical Society had been trying to transform an old school into an arts centre and in 2006, Cathy accepted the challenge. By 2008, the Church Street School Cultural Centre was completed and Cathy could not resist the offer to return to Markham Museum.